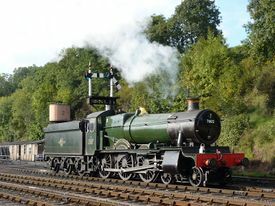 7802 Bradley Manor is one of three Manor class locomotives based at the SVRSevern Valley Railway, the others being 7812 Erlestoke Manor and 7819 Hinton Manor. The Manor Class 4-6-0 mixed traffic locomotive was designed as a lighter version of the GWRGreat Western Railway Grange Class, giving a wider Route Availability. The first 20, including all three at the SVRSevern Valley Railway, were built between 1938 and 1939 and incorporated parts from old GWRGreat Western Railway 4300 Class Moguls. BRBritish Rail or British Railways built a further 10 in 1950 and rated the class 5MTThe British Railways system of classifying steam locomotives by power using a number from 0, least powerful, to 9, most powerful, followed by either F for freight, P for Passenger or MT for Mixed Traffic..
7802 was named after the manor house at Bradley near Newton Abbot, Devon. Initially delivered to London’s Old Oak Common Depot, 7802 soon moved to Bristol working cross country services around Wiltshire, Dorset, Somerset and South Wales. Post-War, 7802 was mainly based at ex-Cambrian sheds and was a well-known performer on 'The Cambrian Coast Express'. In late 1960, 7802 was joined there by sister engine 7812 Erlestoke Manor. Both locomotives were withdrawn at Shrewsbury on 6th November 1965, and both moved to Woodham’s scrapyard at BarryWoodham Brothers Scrapyard, Barry, South Wales. The source of many locomotives now in preservation. in June 1966. Both 7812 and 7802 were acquired from BarryWoodham Brothers Scrapyard, Barry, South Wales. The source of many locomotives now in preservation. by The Erlestoke Manor Fund. 7802 was purchased from BarryWoodham Brothers Scrapyard, Barry, South Wales. The source of many locomotives now in preservation. in 1979. Restoration was finally completed in April 1993, and 7802 ran until August 2000, including a number of appearances on the main line (see below). A quick overhaul was achieved by exchanging Erlestoke Manor’s boiler (withdrawn in 1985) with Bradley Manor’s, allowing a return to service (and main line working) for 7802 in May 2002. The engine is recorded as having surpassed 100,000 miles of running in preservation in 2009. 7802 Bradley Manor was withdrawn from service again at the end of the 2010 season, having accumulated over 110,000 miles in preservation, including working on the main line. Another overhaul was undertaken, with the chassis being overhauled at Tyseley Loco Works and the boiler overhauled in the SVR Bridgnorth Boilershop. This overhaul was completed in November 2015, the return to service coinciding with the 'Manor 50' weekend celebrating the end of steam on the Cambrian network. Bradley Manor has used a 4000 gallon CollettCharles Benjamin Collett, Chief Mechanical Engineer (CME) of the Great Western Railway 1922-1941 tender in preservation (main picture above). Owning group The Erlestoke Manor Fund are constructing a more appropriate 3500 gallon ChurchwardGeorge Jackson Churchward, Chief Mechanical Engineer (CME) of the Great Western Railway 1902-1922 tender for Bradley Manor using serviceable parts from the remains of a GWRGreat Western Railway 3500 gallon tender (No T2329) which they acquired in ex-Barry condition from the Llangollen Railway and owning group of ex-GWRGreat Western Railway PrairieLocomotive with a 2-6-2 wheel configuration tank 5532. In July 2011 it was duly delivered to Bewdley. The Fund have since set about recovering the re-useable parts including horns, axle boxes, some springs and spring brackets, rear steps, draw bars, some brake gear and brake cylinder parts together with various other parts such as tank filler and beading which eventually can be incorporated into the tender tank. They opted not to re-use the somewhat deteriorated tender frames or wheels, which will be available for resale elsewhere.. As of January 2019[update], work on this is continuing at Tyseley. Sister locomotive 7812 Erlestoke Manor already has a 3500 gallon tender, No T2334; the contrast in tender size may be seen in the picture below. In January 2018, this tender was detached prior to 7812's move to Tyseley for overhaul, with the 3500 gallon tender remaining at Bridgnorth to be repainted and paired 'temporarily' with 7802. The swap was completed in March 2018. Bradley Manor features on the pub sign of The Railwayman's Arms at Bridgnorth. She also featured on the 42 pence Royal Mail postage stamp from the Classic Locomotives series issued on 13 January 2004. This page was last modified on 16 March 2019, at 10:00.